Finger Lakes Scenic Wonders are two of nature's masterpieces that are perfect for inspiring photos, family fun and creating memories that last for a lifetime. 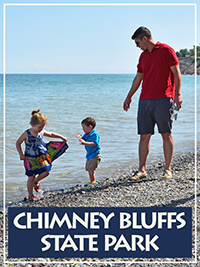 Chimney Bluffs tower 150 feet above Lake Ontario and are large, clay drumlin formed 6-10 thousand years ago by a glacier, then eroded by waves and weather. 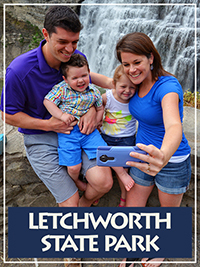 Letchworth State Park, also know as "The Grand Canyon of the East" is one of the most notable examples of waterfall and gorge scenery in the U.S. Come experience two amazing Scenic Wonders of the Finger Lakes of New York State!